No matter what else occurs, there are two things that happen to all human beings. We are born and we die. A friend is now taking the second half of that journey and is passing into the embrace of Isis. And so today I write about death, a subject that was of more than casual interest to the ancient Egyptians. I know I am idealizing the ancients in at least some of my comments about them. But maybe that’s okay for it allows us to find an anchor of wisdom in the past that also makes heart sense for us today as we continue our very-human journey through life and death. 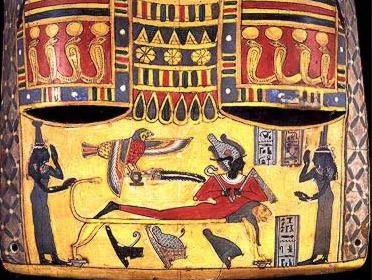 Some early scholars even considered the Egyptians to have been people obsessed by death. But perhaps that was only because they hadn’t yet discovered the love poetry and the silly graffiti. Or perhaps the ancient Egyptians really did have a better handle on it than we do today. By living with the knowledge of their eventual deaths, they were able to squeeze the real sweetness out of life. An image from the TV show Smallville, when Isis possesses Lois. I shall reinterpret it as the Goddess shining Her light on Her deceased priestess in the otherworld. Why not? Isis, of course, has a huge role in realm of the dead. 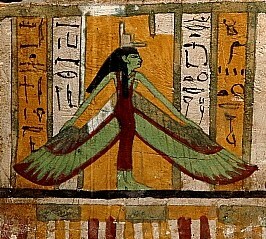 If proto-Isis is, as I believe, the prehistoric Bird of Prey Goddess, Who is both Bringer to Death and Giver of Rebirth, then it is fair to say that human beings have always, always perceived this aspect of Her nature. The ancient Egyptians had many euphemisms for death, even as we do. One of my favorites is “The Great Mooring.” Because boats played such an important part in the lives of the people of Egypt, they were also important in death. The deceased traveled through the otherworld by sacred boat until the boat came to moor at its final destination and was secured to its mooring post. Every Egyptian hoped to safely reach her or his individual mooring post. As The Great Mooring Post, Isis’ name is Menit Weret. Being called by or spoken to by Menit Weret was understood as an important part of the process of death and eventual rebirth. The Coffin Texts tell the deceased that the Great Mooring Post speaks to him and a stairway to Heaven is set up for him, enemies fall before him, and even the stars bow down. Magical words of power ensured that the beings in the realm of the dead would serve the deceased, that his Divine mothers would nurse and kiss him, and that the Great Mooring Post would call to him. 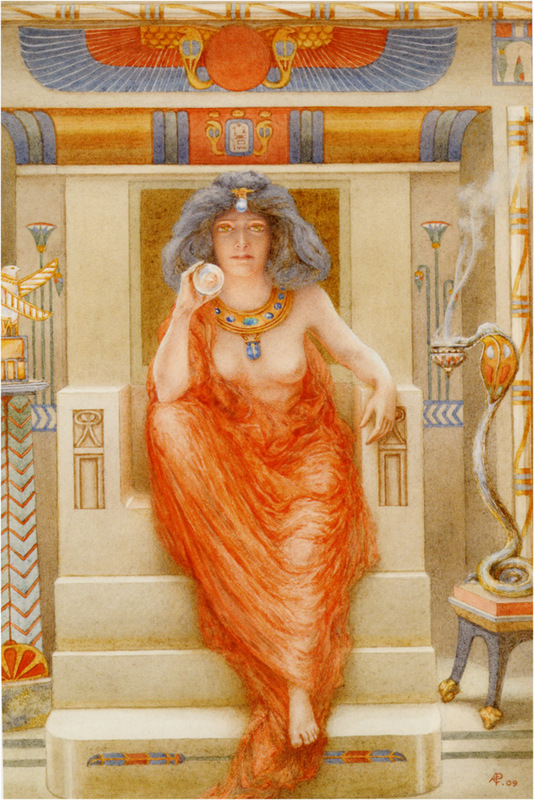 Isis by Armand Point, from about 1909. I’ve never seen this one before and so I include it here for your viewing pleasure. I don’t know what happens once we die. Maybe the atheists are right and nothing happens. I hope not; and I do have faith that there is something more. I also think that—at least as we are dying and perhaps for a while thereafter—we enter precisely the sort of otherworld we expect. That’s why it’s important for the Prophetess or Prophet of Isis to have her or his “death dream.” (Page 608 in the new Isis Magic.) It is in these “lower astral” realms that our expectations about death can be met. If I were a Protestant Christian, I would expect to find Jesus waiting for me. If I were Catholic Christian, I might expect to spend some time in Purgatory being purified. If I were ancient Egyptian, I would expect to journey through the otherworld with my Book of Coming Forth by Day as my guide along the way. As an Isian, I expect Isis to meet me; that is part of my death dream. And I am reasonably confident that this is indeed at least the immediate afterlife that I will experience. Which is good. When my mother died, many years ago now, Isis brought comfort to me and to my grieving father, who was at the time nominally Unitarian, but had no real beliefs about the afterlife one way or another. So I let him borrow mine. I worked the ritual of the Opening of the Ways for an Ever-Living One (yes, also from Isis Magic, pg. 411) for my mother and, in vision, I saw Isis come, wrap my mother in Her wings, and guide her into the otherworld. This felt very certain to me and I shared this with my father. I think it helped him. I know it helped me. Beautiful & thoughtful meditation & ideas about thinking about our own “death dream.” Your own personal experience is & will be a comfort for those still unsure what lies beyond the veil. Its better to meditate and search our own beliefs about the afterlife, before it calls us or our beloved ones home. May Hathor, Lady of the West guide all souls to drink from Her cup & take refuge under the shade of Her sacred sycamore tree.